Some assignments turn out to be just good, “clean” fun. So, I took it as a positive omen that the typical summer mistral was not blowing across the age-old streets of Salon-de-Provence as I approached the factory of Marius Fabre, a veritable institution of soap-making history that has been creating famous French olive oil soaps and lotions for over 110 years. I was fortunate to visit the sanctuary of suds factory and a century of Marius Fabre, from its Golden Era at the end of the 19th century, when Salon-de-Provence was flourishing because of the local soap making and olive oil trading industries, to its current position as one of the few remaining manufacturers of authentic traditionally-made natural soaps and lotions in southern France. First, we started with some pretty fascinating background. Beginning in the Middle Ages, soap fabrication became an important industry in southern France, where all of the ingredients were readily available: olive oil from les Alpilles near Les Baux-de-Provence, and sodium carbonate and marine salt in the Camargue. In the 17th century, Marseille became the largest soap manufacturing region in France. In 1688, King Louis XIV’s finance minister, Jean-Baptiste Colbert, issued an Edict, or rules that regulated the manufacturing and branding of Savon de Marseille. To assure the authenticity and purity of Marseille soap, the royal decree specified the use of great cauldrons and only pure olive oil, forbidding the use of animal fat. Failure to do so was punishable by law. Later, as other vegetable oils like palm and coconut oil arrived from the French colonies, new formulas evolved. Yet, throughout time, the product has remained 100% natural, using only vegetable oils without any coloring or artificial additives and containing 72-percent oil. In the 18th century, production doubled and the impact of sea trade spread the fame of what used to be a regional product. In the early 19th century, with the raise of technology, the saponification process was documented and later analyzed in laboratories. This was the Golden Age of the extra pure 72% oil Marseille soap. In the 1940’s, the industry declined due to the emergence of synthetic detergents, washing machines, supermarkets, new soap companies, and changing consumer habits. Many traditional soap companies closed, but Marius Fabre continued. Beginning in the 1970s, with the renewal of interest in natural products and the environment, Marseille soap gained a whole new host of dedicated followers looking for the purest and gentlest of products. Next, the tour continued with a hands-on visit of the manufacturing facilities. The traditional method and savoir faire of producing Marseille soap in cauldrons has been kept alive from generation to generation by the Marius Fabre soap company in Salon-de-Provence, France, since 1900. It is the oldest traditional soap factory in France, which still produces soap according to the Edict of Colbert and has remained in the same family, today run by the grand-daughter of Marius Fabre, her husband, and two of their daughters. The process begins with saponification in which olive oil (more precisely the oil from olive cake – pulp and pits after the first press), sodium carbonate, and water are mixed in a 20 ton vat and heated to 100-120°C (212-248°F) and stirred constantly during the day for 10 days. The chemical reaction forms a paste. The paste is rinsed several times with marine water to remove the extra sodium carbonate and impurities, guaranteeing the ‘extra pure’ quality of the soap. “For over a hundred years, we have tasted our soap in the cauldrons to check on perfect fabrication. If the paste stings the tongue, it means the soap needs another rinse in pure water,” says Marie-Helene Bousquet, granddaughter of Marius Fabre. While still very hot, about 80°C (176°F), the soap paste is then poured into huge horizontal molds to cool, where it is left to dry and harden for 2 days. On windy days, the windows facing North are opened to let the mistral wind accelerate the process. When the paste is dry, the soap is cut by a wheel-operated blade into 35k blocks. Those blocks are then cut into bars of 2.5k and cubes of 200g, 400g, and 600g. The blocks of soap are placed on wooden shelves to dry. 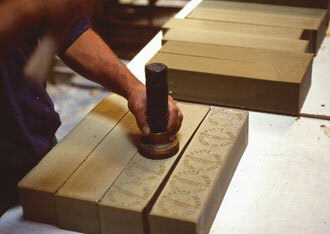 After spending 2 days in a drying oven, the traditional Marseille soaps are stamped on all six sides. As a Francophile from way back, I was well aware of the outstanding reputation of Savon de Marseille. During my afternoon visit, I learned much from the experts at Marius Fabre that expanded my view of why it has been in vogue for hundreds of years. Marseille soap is totally natural, made exclusively of 72% pure vegetable oil (olive oil from the region; copra and palm oil from the former French colonies) without artificial coloring or synthetic additives. It is gentle and effective enough to be used on skin, as well as delicate fabrics such as silk, lace and baby clothes. Because it is hypoallergenic, dermatologists often recommend it for skin problems, midwives suggest it for newly-born babies, and it is even the preferred choice of pet groomers. As an anti-bacterial cleanser, it is an excellent disinfectant. In today’s world, this eco-friendly product reminds us that good choices can be made in many ways to honor the planet. Marius Fabre soap is 100% biodegradable and does not contain phosphates or synthetic substances that would pollute the environment. The company does not use animals for research or testing. And better choices don’t have to stress our wallets either, since the soap lasts up to twice as long as ordinary commercial soap. The Olive Oil Source's new online Boutique offers many wonderful products by Marius Fabre, not only the famous Savon de Marseille, but also lotions, shampoos, heavy-duty soap for extra dirty hands, and a fantastic concentrated general purpose liquid soap. We hope you will enjoy Marius Fabre products as much as we do!